Judah Loew ben Bezalel (1525 – 1609) was a major Talmudic scholar, Jewish mystic, and philosopher. He is widely known to scholars of Judaism as the Maharal of Prague, or simply the Maharal (מהר"לz) a Hebrew acronym of Moreinu ha-Rav Loew—"Our Teacher the Rabbi Loew." A prolific writer, he was for many years the leading rabbinical authority of Moravia and later chief rabbi of Posen, Prague, and all of Poland. The Maharal is famously associated with the legend of the golem, in which he supposedly created the powerful living creature by using magical powers derived from the Kabbalah, in order to defend the Jews of Prague from antisemitic attacks. In a more serious sense, he is known for his works on Jewish philosophy, mysticism, and his writing known as Gur Aryeh al HaTorah a commentary on Rashi's biblical exegesis. A critic of the narrow tradition of Talmudic learning who popularized several key kabbalistic concepts such as holiness of sexuality and the correspondence of the spiritual and physical worlds, his teachings later came to be influential in some branches of Hasidic Judaism. 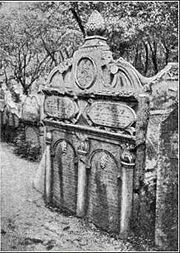 Judah Loew ben Bezalel is buried at the Old Jewish Cemetery, Prague in Josefov, and his grave can still be visited. The name "Löw" or "Loew" is derived from the German Löwe, "lion." The Yiddish Leib is from the same origin. The name is related to the Hebrew patriarch Judah or Yehuda, who is traditionally associated with a lion. In the Book of Genesis, the patriarch Jacob refers to his son Judah as a Gur Aryeh, a "Young Lion" (Genesis 49:9) when blessing him. The Maharal's classic work on the Rashi commentary of the Pentateuch is known as Gur Aryeh al HaTorah: "Young Lion [commenting] upon the Torah." The Maharal was probably born in Poznań (Posen) in today's Poland, though his family seems to have originated from the German town of Worms. His birth year is uncertain, with different sources listing 1512, 1520, and 1526. His uncle Jacob was Reichsrabbiner ("Rabbi of the Empire") of the Holy Roman Empire, and his brother Chaim of Friedberg, was a well known rabbinical scholar, as were his two other older brothers. Traditionally it is believed that the Maharal's family descended from the Babylonian exilarchs and were therefore also from the Davidic dynasty. He received his formal education in various yeshivas (Talmudic schools). Despite the family's prominence, it is likely to have moved to Poland along with many other Jews to escape the increasingly intolerant attitude toward Jews of Germany during this period. Educated in the strict Talmudism typical of rabbinical education in his day, Judah Loew later challenged the limits of this conservative tradition. He read the kabbalistic text of the Zohar and other esoteric books with enthusiasm. He also studied the classical Jewish philosophical texts, such as the writings of Maimonides and Crescas, and was familiar with current secular subjects like physics and astronomy. An avid reader, his later writings refers to the findings of Copernicus and Martin Luther's German translation of the Bible. 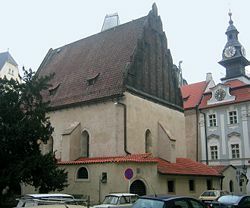 View of the synagogue of Rabbi Judah Loew, now called the Old New Synagogue, in Prague. Judah reportedly married his wife Pearl at the age of 32 after a long delay, due to financial troubles in her family. They would have six daughters and a son. Judah himself was independently wealthy, probably as a result of his father's successful business enterprises. Judah accepted a rabbinical position in 1553 as Landesrabbiner of Moravia at Mikulov (Nikolsburg). This position, which he held until 1573, involved directing Jewish community affairs as well as determining the schedule of Talmud studies in the communities in that province. He also revised the Jewish community statutes on the election and taxation process. While still in Moravia, Judah fought against slanderous allegations of illegitimacy that were spread in the community against certain families, which could ruin their ability to find a marriage partner for their children. This issue also affected his own family. After leaving Moravia, probably due to anti-Jewish persecutions there, Loew was active in Prague, where he established a yeshiva and became known for his relatively broad approach to Talmudic studies and his corresponding criticism of the tedious scholastic attitudes of other rabbinical authorities. He also ran afoul of powerful Jewish leaders who continued to deny the legitimacy of their fellow community members and even besmirched the good names of those who were already dead. The Maharal boldly denounced this phenomenon, going so far as to pronounce a sentence of excommunication on those guilty of slanderous rumor-mongering. "This we did here in Prague on the Sabbath of Repentance (Yom Kippur) in the year 1584," he writes. "We issued a powerful edict of excommunication in the presence of ten Torah scrolls which were held by the wise men of Prague, each scroll in his hand, against the spread of any slander against the departed and against calling anyone in Israel by the slurring epithet of nadler." The Maharal was passed over for election as the chief rabbi of Prague in 1584 in favor of his brother-in-law, Isaac Hayoth, who was of a more conservative bent in his philosophical attitude and less prone to criticize people in high places. Loew then gladly accepted the call of his native community, Posen, to serve as its rabbi. He moved back to Prague in 1588, to replace the retired Isaac Hayoth. On February 23, 1592, he was called to an audience with Emperor Rudolf II. The conversation seems to have been related to the Kabbalah (Jewish mysticism) a subject which held much fascination for the emperor. In the same year, the Maharal moved back again to Posen, where he had been elected as chief rabbi of Poland. There, he composed Netivoth Olam and part of Derech Chaim. Toward the end of his life he moved back to Prague, where he died in 1609. He is buried there, and his tomb still an attraction for tourists. Although he was not an open proponent of the Kabbalah per se, the Maharal adopted some of its key doctrines, which he popularized in his many writings and speeches. For example, he denounced the morbid attitude toward sexuality which was prevalent in Christian society and also among many Jews. For him, the male and female principles were manifestations of the image of God in humankind. Love between the sexes, he believed, was a glorious manifestation of the Divine, as well as being the foundation of the family and society. The Maharal also promoted the kabbalistic attitude that the physical world exists in parallel to the higher spiritual world, and that these two correspond to each other. He was not, however, a champion of the open study of Kabbalah, and none of his works are openly devoted to it. Nevertheless, kabbalistic ideas permeate his writings in a rational and philosophic tone. His main kabbalistic influences appear to have been the Zohar and Sefer Yetzirah. The so-called Lurianic Kabbalah had not yet reached Europe in the Maharal's time. The Maharal was also entirely in favor of scientific research insofar as it did not contradict divine revelation. He was an outspoken critic of the method of Talmud study known as pilpul which painstakingly attempted to reconcile various texts or to harmonize fundamental differences of approach between various earlier authorities. He was content to let differences remain as differences, and even to encourage a degree of mystical speculation. Although he certainly had other pupils in Moravia, Judah's main disciples from the Prague period include Rabbis Yom Tov Lipmann Heller and David Ganz. The former promoted his teacher's program of regular Mishnah study by the masses, and composed his Tosefoth Yom Tov—a commentary incorporated into almost all modern editions of the Mishnah—with this goal in mind. David Ganz produced the Tzemach David, a work of Jewish and general history, as well as writing on astronomy. 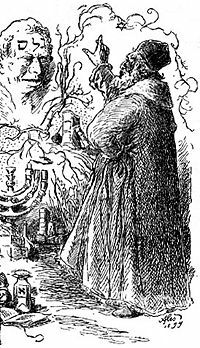 The story of Rabbi Judah Loew's golem, written by Wolf Pascheles in 1847, appeared in a collection of Jewish tales entitled Galerie der Sippurim. The story seems to be based on legends of the Maharal's mystical powers which had circulated earlier in the oral tradition. Other accounts followed later, including the 1909 publication of the legend by Yudl Rosenberg, who was the first to mention the golem as defending Jews from those who would raise the nefarious blood libel against them. The tale appears in several other variations. According to the legend, the Jews in Prague were being persecuted by the Christians, who often accused them of ritually murdering children so they could use their blood to make matzo. Some of the persecutors even sneaked into the Jewish ghetto to deposit the body of a child on the street in an attempt to incite people against the Jews. The Maharal, always devoted to the welfare of his people, prayed for a vision to tell him how to stop these false accusations, and was told by Heaven to "make a human image of clay." The rabbi took his son-in-law and his favorite student down to the river and formed the shape of a man from clay. They each walked around the figure seven times, reciting a kabbalistic formula, and the golem was brought to life. The golem appeared to be a man of 30, and the rabbi clothed him and named him Joseph. Through the use of a talisman, the golem could appear invisible, and was sent out to stop anyone carrying a large parcel. When a person was found intending to deposit the body of a dead child in the Jewish streets, the golem would tie up the offender and the evidence, and carry both to the authorities. Once the blood libel was declared to be groundless and persecutions were forbidden, Rabbi Loew removed the breath of life from the golem by walking around the figure seven times again, repeating the same words in reverse order. In other versions of the story, the golem becomes uncontrollable, a Frankenstein's monster wreaking havoc on the community or the entire city, attacking Jews, Gentiles, and even Rabbi Loew himself. Other variations say that the word meaning "truth" was put on the golem's forehead to animate it, and to return the golem to a lump of clay, the first letter was erased, thus spelling "death." Tomb of Judah Loew ben Bezalel in the Old Jewish Cemetery, Prague. Although he is most famous because of his association with the legend of the golem, the Maharal's most important legacies are his contribution to the midrashic tradition through his commentary on Rashi, and his influence on his pupils. In the next century, the Maharal's works inspired the Polish branch of Hasidism, as well as a more recent wave of Torah scholars originating from Lithuania and Latvia, most markedly Rabbi Eliyahu Eliezer Dessler (1892-1953) and Rabbi Abraham Isaac Kook (1864-1935). A recent authority who had roots in both of these traditions was Rabbi Isaac Hutner (1906-1980). As a mark of his devotion to the ways of the Maharal, Rabbi Hutner bestowed the name of the Maharal's key work, the Gur Aryeh, on a branch of the yeshiva he headed in New York during the 1950s, known as Kollel Gur Aryeh. The legend of the Maharal's creation of the golem inspired Gustav Meyrink's 1915 novel Der Golem. Various other books have been inspired by this legend. The Maharal is featured in the book He, She and It and the Dutch work De Procedure ("The Procedure," Harry Mulisch, 1999), both retellings of the golem legend. A poem by Jorge Luis Borges, entitled "El Golem" also tells the story of Judah Loew and his giving birth to the golem. Various other works, such as his responsa and works on the Jewish Sabbath, Sukkot, Rosh Hashana, and Yom Kippur, have not been preserved. History of "Judah Loew ben Bezalel"
This page was last modified on 13 June 2018, at 14:45.